MOM OF 2 A MUST BUY- CUTE AND FUN. Js Momma I bought this not when my son was VERY young not knowing much about it during one of the B1G1 sales at Toys R Us. When he was around five months old he started playing with it. Was able to tap the shapes down for the lights to light up and music to play. He is just about 1 year old and he still loves this toy - I know as he gets bigger he'll continue to discover new things about it. When older children come over to play (His 3-4yr. old cousins) they love this toy too!!! Well worth the money!!! MommyofTwo We bought this for my 8 month old son, he loves to play with it. Actually even my 3 year old loves to play with it. We have quite a few of the Laugh 'N Learn products and love them all, when I saw this one I knew we had to get it for my son. My only complaint is that it is very top heavy and when my son is playing with it sometimes he pulls it over on himself and gets pretty upset about it, the top part hits him in the face sometimes. I wish the base was more sturdy, but everything else is great!! 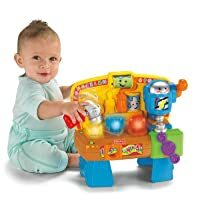 kimrdrgz We bought this for my 8 month old son, he loves to play with it. Actually even my 3 year old loves to play with it. We have quite a few of the Laugh 'N Learn products and love them all, when I saw this one I knew we had to get it for my son. My only complaint is that it is very top heavy and when my son is playing with it sometimes he pulls it over on himself and gets pretty upset about it, the top part hits him in the face sometimes. I wish the base was more sturdy, but everything else is great!! Jessi I actually bought this product from [...] of all places, and my 11 month old son gets sooo much pleasure out of this toy! He loves to hit the hammer on the glowing "nails", and the music is suprisingly delightful! The music never gets annoying as it has 3 settings and three different ways for your child to play. This toy keeps my son occupied for a good twenty minutes so I can shower. The toy is very good about teaching your child different colors as on one setting the nails glow with a song and the song stops leaving one of the nails glowing. Well the song does not continue until your little one hits the nail that is glowing. A++ Highly recomend to anyone! Zachary's Mommy We ordered this for our 1 year old son and it is very cute...just not sure that it's [$] cute. Had I seen this in the store I would not have paid that price for it. Actually I didn't pay that price for it which is why it's getting 4 stars and not less. This is the toy I picked to get for free when Toys R Us had the "buy 1 fisher price toy for $25.00 or more and get another fisher price toy for $24.99 or less free". It is cute and it is fun and it is educational but for the price I just think there's better toys out there that's just as cute, fun and educational. Son seems to like it though so I guess that's all that really matters. Amanda (Mom of 2 under 12 Months) My kiddos LOVE anything Fisher Price Laugh and Learn. Almost all their large toys are Laugh and Learn and they love everyone. My son is currently 9 months and loves this toy but the downside is that it is top heavy and falls over ALOT. The songs and lights are great and education but it is definitely a toy that I sit on the floor and hold up for him. Most of the other toys he can play with on his own. He gets frustrated after awhile because of the falling over but will go back again to play later. Generally great but could be better. Top heavy! Mama o' Twins I bought this toy for my twin girls. I liked the features that it offers, from the songs and moving parts, but especially that it encourages learning. My girls love to push the pegs as they light up and they dance to the songs. Boy or girl, this is a great toy. I'd really recommend it. The only thing that I have against this toy, and it's minor, is that you have to lean it against something sturdy. As the kids start to try to stand, they might lean on it for support and it could topple. MA Mom My son has had this toy since he was 6 months old, and he still loves to play with it. Very durable, lots of different play modes, and easy to clean. When my son was small, the toy did seem to be a little "top heavy" as some of the other reviews have said, but now that he is bigger and able to sit or stand to play with it, the toy is perfect. Jessica My son LOVES his little work bench (@ 4 months) He is able to sit in front of it and press the buttons and pull the level. He can seriousl sit there for 30 minutes and just play with the bench by himself! There is a music setting (which I have it on now) and then a learning setting (for numbers and letters) Def a toy worth having! !